Saildrive gasket is new from 2016. Sails are made of high tencile dacron polyant. 12 volt, 5 batteries charged by: engine, wind generator, shore power, generator Hydrogenerator: AQUA4GEN ATMB 12 V revised in 2016. Watermaker: SEA RECOVERY Ultra Whisper Compact UWC 400 DC 12 V Capacity 63 L/h, revised 2016, new primary filter 2017. Generator is a small HONDA portable one. The hull is made of cold-molded wood on a striplanking base with fiberglass and epoxy resine. The deck is made of marine plywood, fiberglass and epoxy resine. The roof is a sandwich marine plywood/Airex foam/fiberglass and epoxy resine. At starboard stern is a technical local offering a place for storing your wet clothes a very easy access to the engine and all the sensitive equipments. - B&G HYDRA with double command boxes. - Raymarine ST 6002 with double command boxes. One bilge pump is a high flow stainless steel FLOTEC FP 14 KVX 220 V/600 W flow 14000 l/h running on generator from 2016. 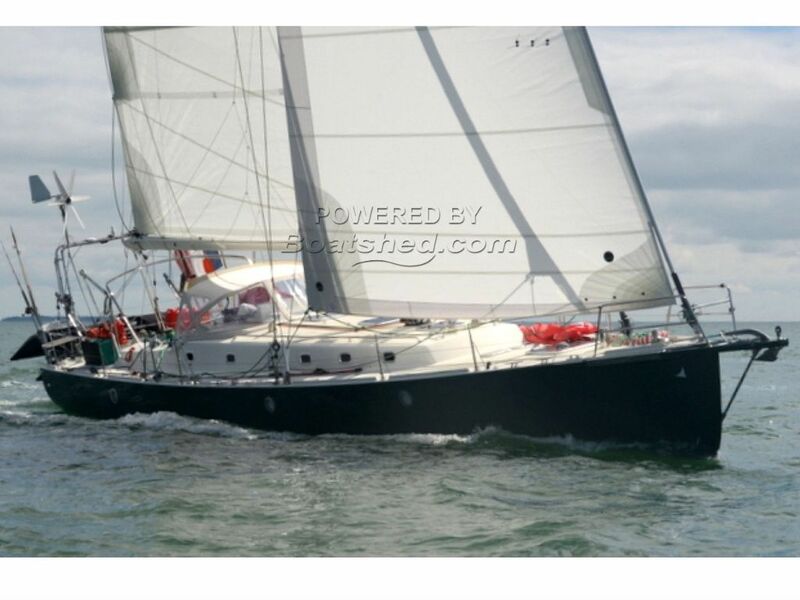 A sail yacht for sale in France. Boatshed La Rochelle is pleased to offer this blue water sail boat for sale, designed by Patrick Balta and built by Charlie Capelle's shipyard in La Trinité-sur-Mer, France, this yacht has been seriously prepared for a polar trip by an experienced yacht captain 3000 (STCW). She is made of cold-molded wood + strip-planking and is fully equiped with high quality equipment allowing long offshore cruising with a high autonomy and security. Perfectly maintained by a meticulous owner she has benefited of a full recent refit including a new hull painting. If you are looking for a fast trans-oceanic cruising yacht easily maniable by a couple with a maximum of confort and a warm luminous wooden inside, she will be you ideal choice. For more information or organise a visit, please contact Etienne your local broker at Boatshed La Rochelle. This Custom Sloop TOCADE 50 has been personally photographed and viewed by a representative of Boatshed La Rochelle. Click here for contact details. Please note this comments section is public. Please do not post your personal details here. To enquire about purchasing this boat, please contact the broker directly at boats@boatshedlarochelle.com. Please read our commenting guidelines before posting.